Honda offering a Hybrid car, is nothing new, the first one was the Insight back in 1999, but Hybrids have become more important, and many more are now offered, but what does Hybrid mean, just because the car has a Hybrid badge stuck on it, doesn’t mean they are all the same system. 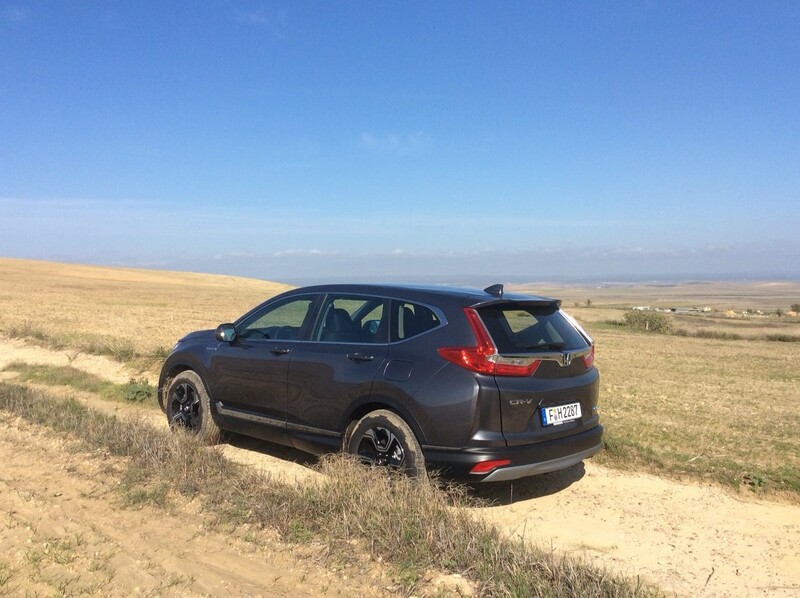 Although the CR-V Hybrid, and indeed Hybrid is new to the UK, Honda have been selling them, and developing and improving them over many years, and to date Honda have sold over 2.4 million Globally. Honda have chosen to discontinue the CR-V diesel and the Hybrid petrol has been introduced to replace it. 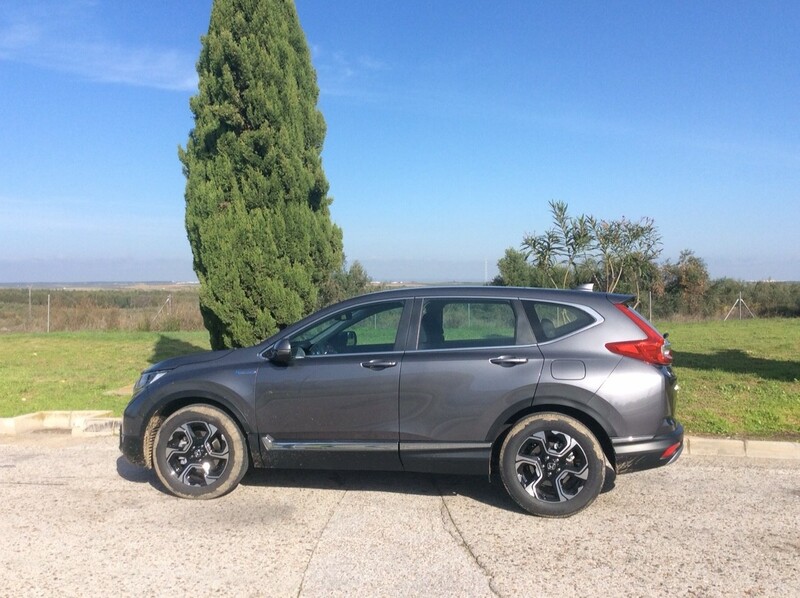 But it isn’t just the introduction of the Hybrid on the CR-V, it has also had a makeover, and other changes under the skin. Its wheelbase is 30mm longer, giving it even more cabin space. It now has an Active Shutter Grille for advanced Aerodynamics that closes for efficiency, but opens when cooling is needed. The chassis is lighter than ever before and an all-new suspension delivers a more comfortable and a better driving experience. This facelift CR-V has also had some minor exterior changes. In Spain the cars were a bit short, not in length, but in numbers available to drive, so we were four to a car, and plenty of driving on a variety of roads. Great, we thought, all day, in and out of the car for driver changes, and some of that in the back of a car, cramped and will be very grumpy by the end of a long day. But none of that, it has so much room, loads of legroom, plenty of headroom, and the two rear passengers are nowhere near each other, so a really comfortable place to be for a long time. Put very simply, and in a language and way even I can sort of understand – the new 1.5-litre petrol engine is connected directly to a generator, this generator, as you would expect, generates electricity. The electricity is then stored in lithium-ion batteries stored under the rear seats. The batteries then power the electric motors, and the electric motors turn the wheels. On very rare occasions, a clutch is released and the petrol engine powers the wheels directly. Now.. some on the press event wondered why Honda had gone to all this trouble of creating all this advanced technology, added weight, and made the propulsion of the car so complicated. Surely, some thought it would have been better to have not bothered with a generator, batteries, motors, etc, and all the other bits and pieces to make it work. But the counter argument, is that by using this system, the emissions are reduced and fuel consumption is also improved. But whatever you think about this Hybrid system, whichever way you lean, it does work, and work extremely well. Honda’s engineers have obviously spent much time and money developing a system that is more environmentally friendly and as efficient as a diesel. The cost of the Hybrid 1.5-litre is around £800 more than a non-Hybrid 2.0-litre with CVT automatic, so on paper looks good value, and not much of a premium to be paid for all that technology. But the CVT is around £2,000 more than the manual version, so in effect it is £2,800 more, if anyone looks at it like that. Prices for the new Hybrid start from £29105 and go up to £37,255. The volume seller is expected to be the top spec EX AWD. The new CR-V is available with either 2WD or 4WD with sales expected to be split evenly between the two.